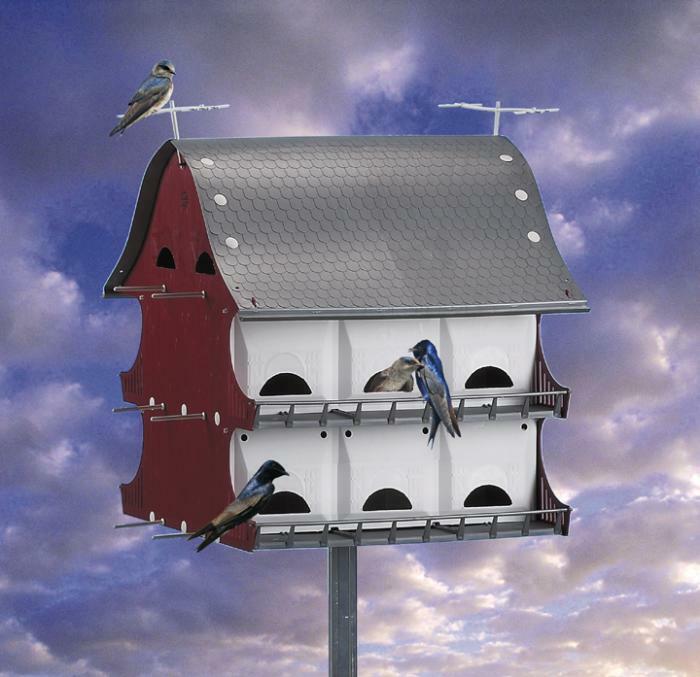 The 16 Family Purple Martin House from S&K Manufacturing snaps together in minutes, no tools required! 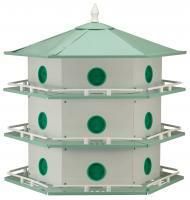 This replica UV-grade polypropylene copolymer dual-story barn is fully equipped with a multitude of perches and its lightweight and durable construction will safely and securely house useful and beautiful bug-hungry martins. Your garden will flourish under the guard of the birds that are sure to take up residence here, and its tilted construction prevents water from accumulating inside and out for a long-lasting country residence for your fine feathered friends. 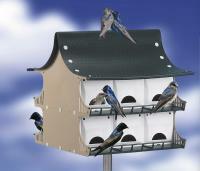 • 16 compartments 6"x 6"x 6"
Great birdhouse. Very decorative. I did not mount it on a telescoping mast as it was hopefully going to be a useful decoration for another project. But, the mount for their triangular telescoping post was plain to see and instructions were clear on how to use it.... The house looks beautiful and I will be able to reach it with a ladder... It was easy to put together and a welcome addition to our backyard's decor. Someday maybe it will attract some tenants. Only real downside is that I wanted to double the living spaces for each nest (anc cut room number in half), but I don't think the instructions were as clear on that as they could have been... Otherwise, a great little project that only took an hour or so to build. I added black sharpie to highlight the "shutters" and other window treatments on the nest openings. Very happy with this purchase. Your product is amazing! 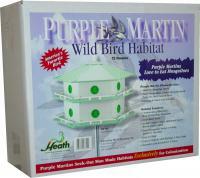 My husband and I love our new Purple Martin House! It looks wonderful in our yard, and the martins have already been scouting it out. I really like this box. We had an older wooden one. The Martins are here and in the box. Most excellent - it is a sight to behold on its lofty perch, in the back yard. It is easily assembled and looks nice. The Martins just haven't come yet. It is pretty, came on time but no martins yet. We gave it to our daughter in New England. She was astonished and delighted, and it is already home for her friends! It looks great out in our huge backyard. Now just waiting for the Purple Martin families to show up. This is a pretty house that goes together easily. We had an existing round pole and just added a wood base underneath with bolts and worked beautifully. Only had to shave off the protruding triangle base. I would recommend this product to a friend. Much larger than I had anticipated. Appears easy to clean out.